Collectors, here is your chance to own one of these gems! Hi Guys! This is something we didn't include in Issue 7 of the Ridiculously Random Recap, so we felt it appropriate to dedicate a separate post to it. In case you haven't heard among other channels across social media and the web, AllSoulsCon is auctioning signed US and Foreign editions of the All Souls Trilogy! Proceeds benefit the Bodleian Library. If you collect these books - we know there are many of you out there - this is for you! No joke, we've seen people who dedicate entire book shelves to the different editions so they can admire all of the cover artwork from this beloved trilogy! What a great opportunity to add to your stack! 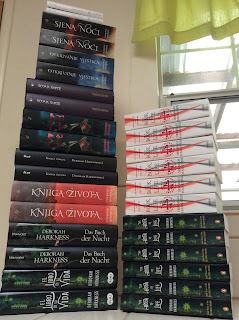 All of them have been signed by Deborah Harkness. If you are thinking of starting a collection of the different versions, this would be a great time to start. Or if you know a fan that happens to be collector, you've landed yourself a great holiday gift-giving idea! All auctions start at 35 US dollars. AllSoulsCon is auctioning a number of US and foreign editions on eBay: http://www.ebay.com/usr/allsoulscon3. These were all signed by Deborah at AllSoulsCon, and all the proceeds are donated to the Bodleian Library.